B&C Technologies is the industry leader in commercial and industrial laundry equipment. The driving force behind B&C are some of the most trusted names in the laundry industry. In fact, they were the driving force behind the design and development of the original brand of Uni-Mac equipment. The Bruce and Cowen families have been instrumental in the design and production of many of the most recognized machines in the field. As a family owned company, they believe in personal service and will never have a corporate feel. Their designs are engineering driven and our machines are tested to ensure they withstand the rigors of the most demanding laundry application. 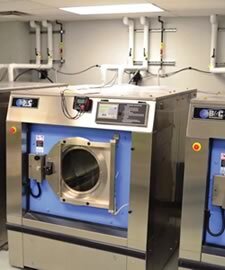 B&C offers a complete line of commercial laundry equipment to fit any laundry need and with our recently expanded line, they have the most comprehensive line available from one single source. They believe that you don’t have to sacrifice quality for economy. All of their lines are built to last and designed to save money allowing us to offer the lowest cost of ownership in the industry. They don’t stop there. They also offer a complete line of parts to fit most machines at low prices. From their reliable line of washers to their durable line of dryers and finishing equipment they have everything you need available through Justin Laundry Systems.